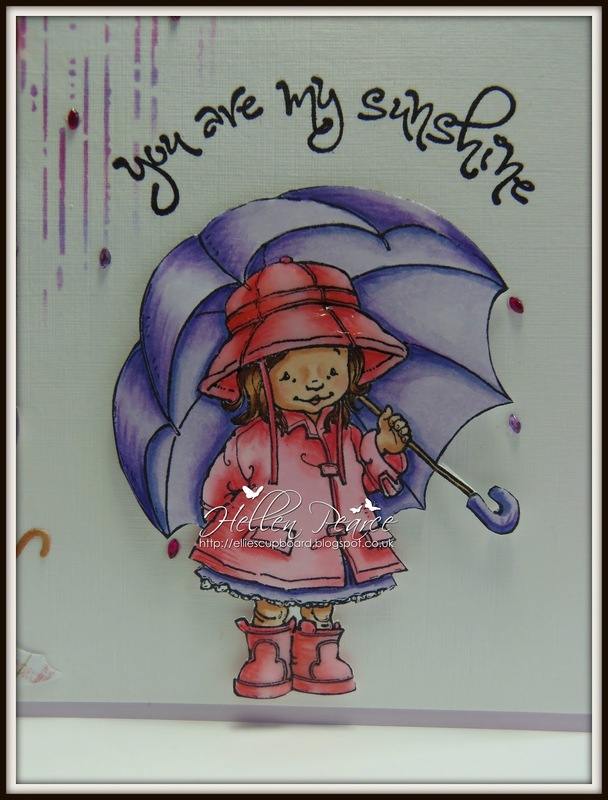 This is a sweet little image by Mo Manning called You Are My Sunshine which I coloured in cool pinks and lilacs - her hat and wellies are glossy (as all good wellies should be!). 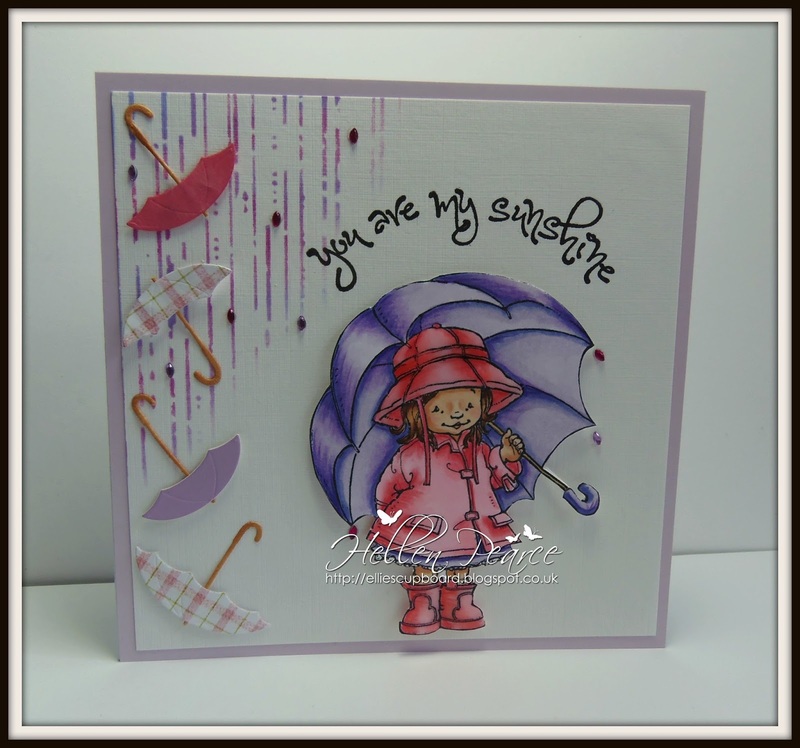 Thought I'd add some gorgeous little umbrellas I cut using one of my MB dies and a little sprinkle of rain using a stencil. Such lovely images that Mo designs, I'm in heaven being on her team. Watch out for my next one next Thursday - just don't know what to pick !! 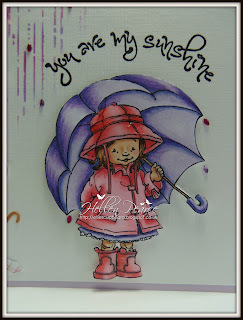 Thank you for looking - don't forget to take a peek at my team mates inspiration on their blogs or on Mo's Facebook page - Bella and Bronte's Clubhouse. Skin E000, E00, E21, E11 and R20; Hair E21,E25 and E29; BV00,BV02 and BV13; RV10, RV21 and RV13. 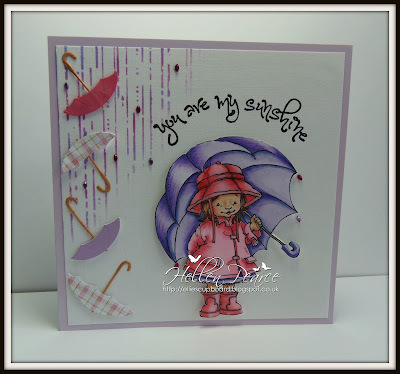 Polychromos Pencils to highlight, Picked Raspberry and Shaded Lilac DIs used with Memory Box Stencil Texture Scraped Paint, Memory Box Die Come Rain or Shine for the umberellas. Clear lacquer on rain hat and wellies.Oval gems. This is so adorable Hellen, such a lovely image. I can understand that it must be hard to choose between all of the great images. awww... your cards just keep getting better and better !